As a person advances in age, he usually develops physical limitations. He will not be able to move like he used to or do the things that he used to do. As such, he will be needing assistance for different activities he does daily. American Safety Options, Inc. understands that these limitations can hinder the ability of your elderly to take care of his own pets at home. Although having pets are beneficial to the elderly, taking care of them can also be a daunting task. 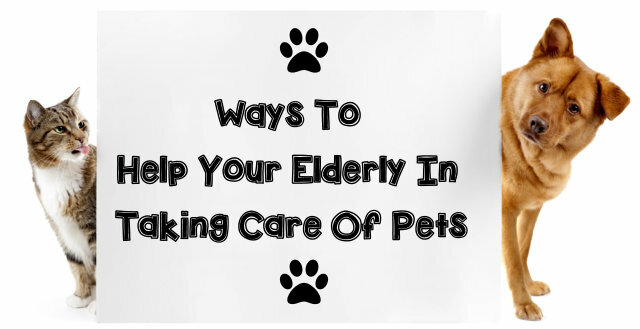 Here are some ways on how you can help your own elderly take care of his pet. 1. Take the pet out for a walk. Your elderly’s pet will definitely need its daily dose of exercise. This is most especially true if he has a dog for a pet. Since your elderly might not have the strength and endurance to walk or run even for a short mile, you can volunteer to take the pet out for a walk, instead. You can choose to go to a nearby park or just walk around the block. You can volunteer to go to the pet store to purchase the supplies that your elderly’s pet needs. You can be the one to drive to the pet store and load the supplies on the car. Once you reach your elderly’s home, unload the supplies and put them in their proper storage places. Most elderly people rely on fixed incomes. If you have extra cash, your senior will also appreciate it if you will shoulder the price of even a kilogram of pet food. 3. Make sure that the pet is clean. The pet must remain clean for it not to cause sickness to the elderly owner. Since your elderly most likely has mobility issues, you may need to do the grooming yourself. If you do not know how to bathe his pet, then, you can opt to send it to a professional pet grooming service. If you have time to spare, you can feed the pet yourself. This way, your senior will not have to really move around and bend a few times just to lay down pet food on the floor. 5. If you can’t do it, hire someone who can. We can assist your senior citizen in taking care of his pet. Our caregivers are knowledgeable and skilled in providing pet care assistance. Our home health agency in Newtown Square Pennsylvania can ensure the over-all well-being of both your elderly as well as his pet. Call us at 484-423-3446 today for further inquiries.